This book is the premier text on the properties and applications of surfactants. 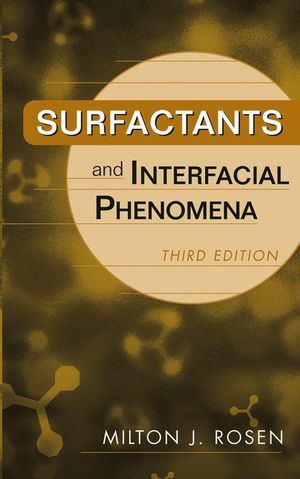 The third edition is completely updated and revised, including new information on gemini surfactants (a new type of powerful surfactant), superspreading (or superwetting) by aqueous surfactant solutions of highly hydrophobic surfaces (important in agricultural applications), and dynamic surface tension (an important interfacial property not covered in the first two editions). MILTON J. ROSEN is Director of the Surfactant Research Institute at Brooklyn College of the City University of New York. 1 Characteristic Features of Surfactants. A Conditions Under Which Interfacial Phenomena and Surfactants Become Significant. B General Structural Features and Behavior of Surfactants. 1 General Use of Charge Types. 2 General Effects of the Nature of the Hydrophobic Group. I Characteristic Features and Uses of Commercially Available Surfactants. 3 Sulfuric Acid Ester Salts. 4 Phosphoric and Polyphosphoric Acid Esters. 1 Long-Chain Amines and Their Salts. 2 Acylated Diamines and Polyamines and Their Salts. 4 Polyoxyethylenated (POE) Long-Chain Amines. 5 Quaternized POE Long-Chain Amines. 1 POE Alkylphenols, Alkylphenol ‘‘Ethoxylates’’. 2 POE Straight-Chain Alcohols, Alcohol ‘‘Ethoxylates’’. 5 Long-Chain Carboxylic Acid Esters. 7 Tertiary Acetylenic Glycols and Their ‘‘Ethoxylates’’. I.E Newer Surfactants Based Upon Renewable Raw Materials. 1 a-Sulfofatty Acid Methyl Esters (SME). II Environmental Effects of Surfactants. II.B Surfactant Toxicity To and Bioconcentration in Marine Organisms. 2 Adsorption of Surface-Active Agents at Interfaces: The Electrical Double Layer. I The Electrical Double Layer. II Adsorption at the Solid–Liquid Interface. II.A Mechanisms of Adsorption and Aggregation. 1 The Langmuir Adsorption Isotherm. II.C Adsorption from Aqueous Solution Onto Adsorbents with Strongly Charged Sites. II.D Adsorption from Aqueous Solution Onto Nonpolar, Hydrophobic Adsorbents. II.E Adsorption from Aqueous Solution Onto Polar Adsorbents without Strongly Charged Sites. II.F Effects of Adsorption from Aqueous Solution on the Surface Properties of the Solid Adsorbent. 1 Substrates with Strongly Charged Sites. II.G Adsorption from Nonaqueous Solution. II.H Determination of the Specific Surface Areas of Solids. III Adsorption at the Liquid–Gas (L/G) and Liquid–Liquid (L/L) Interfaces. III.B Calculation of Surface Concentrations and Area per Molecule at the Interface By Use of the Gibbs Equation. III.C Effectiveness of Adsorption at the L/G and L/L Interfaces. III.D The Szyszkowski, Langmuir, and Frumkin Equations. III.E Efficiency of Adsorption at the L/G and L/L Interfaces. III.F Calculation of Thermodynamic Parameters of Adsorption at the L/G and L/L Interfaces. III.G Adsorption from Mixtures of Two Surfactants. 3 Micelle Formation by Surfactants. I The Critical Micelle Concentration (CMC). II Micellar Structure and Shape. II.B Surfactant Structure and Micellar Shape. IV Factors Affecting the Value of the CMC in Aqueous Media. IV.A Structure of the Surfactant. IV.D The Presence of a Second Liquid Phase. V Micellization in Aqueous Solution and Adsorption at the Aqueous Solution–Air or Aqueous Solution–Hydrocarbon Interface. VI CMCs in Nonaqueous Media. VII Equations for the CMC Based on Theoretical Considerations. VIII Thermodynamic Parameters of Micellization. IX Mixed Micelle Formation in Mixtures of Two Surfactants. 4 Solubilization by Solutions of Surfactants: Micellar Catalysis. I Solubilization in Aqueous Media. I.B Factors Determining the Extent of Solubilization. 1 Structure of the Surfactant. 2 Structure of the Solubilizate. 4 Effect of Monomeric Organic Additives. 5 Effect of Polymeric Organic Additives. II Solubilization in Nonaqueous Solvents. III Some Effects of Solubilization. III.A Effect of Solubilization on Micellar Structure. III.B Change in the Cloud Points of Aqueous Solutions of Nonionic Surfactants. III.C Reduction of the CMC. III.D Miscellaneous Effects of Solubilization. 5 Reduction of Surface and Interfacial Tension by Surfactants. I Efficiency in Surface Tension Reduction. II Effectiveness in Surface Tension Reduction. II.B Interfacial Parameter and Chemical Structural Effects. III Liquid–Liquid Interfacial Tension Reduction. IV Dynamic Surface Tension Reduction. IV.B Apparent Diffusion Coefficients of Surfactants. 6 Wetting and Its Modification by Surfactants. 2 Measurement of the Contact Angle. II Modification of Wetting by Surfactants. II.B Hard Surface (Equilibrium) Wetting. III Synergy in Wetting by Mixtures of Surfactants. 7 Foaming and Antifoaming by Aqueous Solutions of Surfactants. I Theories of Film Elasticity. II Factors Determining Foam Persistence. II.A Drainage of Liquid in the Lamellae. II.B Diffusion of Gas Through the Lamellae. II.D The Existence and Thickness of the Electrical Double Layer. III The Relation of Surfactant Chemical Structure to Foaming in Aqueous Solution. III.A Efficiency as a Foaming Agent. III.B Effectiveness as a Foaming Agent. VI Foaming of Aqueous Dispersions of Finely Divided Solids. 1 Physical Nature of the Interfacial Film. 2 Existence of an Electrical or Steric Barrier to Coalescence on the Dispersed Droplets. 3 Viscosity of the Continuous Phase. 4 Size Distribution of Droplets. I.E Theories of Emulsion Type. 2 Kinetic Theory of Macroemulsion Type. IV Selection of Surfactants as Emulsifying Agents. 9 Dispersion and Aggregation of Solids in Liquid Media by Surfactants. I.A Soft (electrostatic) and van der Waals Forces: DLVO Theory. 1 Limitations of the DLVO Theory. II Role of the Surfactant in the Dispersion Process. II.A Wetting of the Powder. II.B Deaggregation or Fragmentation of Particle Clusters. III Coagulation or Flocculation of Dispersed Solids by Surfactants. III.A Neutralization or Reduction of the Potential at the Stern Layer of the Dispersed Particles. IV The Relation of Surfactant Chemical Structure to Dispersing Properties. 10 Detergency and Its Modification by Surfactants. I Mechanisms of the Cleaning Process. I.A Removal of Soil from Substrate. 1 Removal of Liquid Soil. 2 Removal of Solid Soil. I.B Suspension of the Soil in the Bath and Prevention of Redeposition. 1 Solid Particulate Soils: Formation of Electrical and Steric Barriers; Soil Release Agents. II Effect of Water Hardness. II.B Lime Soap Dispersing Agents. IV The Relation of the Chemical Structure of the Surfactant to Its Detergency. IV.A Effect of Soil and Substrate. IV.B Effect of the Hydrophobic Group of the Surfactant. IV.C Effect of the Hydrophilic Group of the Surfactant. 11 Molecular Interactions and Synergism in Mixtures of Two Surfactants. I Evaluation of Molecular Interaction Parameters. I.A Notes on the Use of Equations 11.1–11.4. II Effect of Chemical Structure and Molecular Environment on Molecular Interaction Parameters. III Conditions for the Existence of Synergism. III.A Synergism or Antagonism (Negative Synergism) in Surface or Interfacial Tension Reduction Efficiency. III.B Synergism or Antagonism (Negative Synergism) in Mixed Micelle Formation in Aqueous Medium. III.C Synergism or Antagonism (Negative Synergism) in Surface or Interfacial Tension Reduction Effectiveness. III.D Selection of Surfactants Pairs for Optimal Interfacial Properties. IV The Relation between Synergism in Fundamental Surface Properties and Synergism in Surfactant Applications. II Interaction with Other Surfactant.